Hearing such words can be sobering to patients. But like diabetes, prediabetes has become a diagnosis that’s now considered prevalent. According to the American Association of Diabetes Educators (AADE), there are approximately 79 million people living with prediabetes. That’s alarming considering the condition places these individuals at an increased risk of developing diabetes later in life. Over a three- to five-year period, people with prediabetes have a five- to 15-fold higher risk of developing type 2 diabetes than those with normal blood glucose levels—not to mention it puts them at greater risk for coronary artery disease and strokes. While some patients may experience similar diabetes symptoms during the prediabetes phase, others have no adverse health effects at all. In fact, most people who have prediabetes don’t know it. This is cause for deep concern since the prediabetes phase gives the patient time to reverse unhealthful lifestyle habits and delay the onset of the full-blown disease. It also gives certified diabetes educators (CDEs) the opportunity to play a vital role in the lives of these patients. Prediabetes occurs when blood glucose levels are higher than normal (fasting between 100 and 125 mg/dL) but not high enough to be classified as diabetes (above 126 mg/dL). Individuals with impaired glucose tolerance (2 hour value of 140 to 199 mg/dL) or a hemoglobin A1c level between 5.7% and 6.4% also are classified as having prediabetes. “The same individuals who are at risk for diabetes also are at risk for prediabetes,” says Constance Brown-Riggs, MSEd, RD, CDE, CDN, a national spokesperson for the American Dietetic Association (ADA). Since the disease hasn’t fully progressed, prediabetes is a red flag for patients to make critical lifestyle changes—an area where the diabetes educator can come into play. “One of my patients described a prediabetes diagnosis as a ‘second chance at life,’” Brown-Riggs recalls. The exact timeline of progression from prediabetes to type 2 diabetes is still unclear, says Toby Smithson, RD, LDN, CDE, a spokesperson for the ADA and founder of DiabetesEveryDay.com. But the Diabetes Prevention Program (DPP) has demonstrated that type 2 diabetes can be prevented or delayed through intensive lifestyle changes. The results of the Diabetes Prevention Program Outcome Study (DPPOS), part two of the ongoing DPP, also essentially found that with a little bit of weight loss (about 5% to 7% of body weight) and increased physical activity, diabetes can be delayed or in some cases prevented. After 10 years, there was still a 34% reduction of incidence in developing diabetes in the participants from the intensive lifestyle group, delaying the onset of type 2 diabetes by four years. In addition, the challenges of delivering high-quality care and education to patients with diabetes is growing. 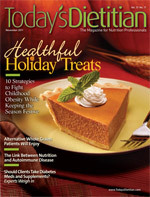 The AADE maintains three positions on the subject: that the diabetes educator is in a unique position to incorporate prevention into self-management skills and education to his or her patients; that each person with prediabetes needs a personalized education plan; and that diabetes educators are critical to diabetes-related preventative efforts and should use evidence-based approaches. The first position of the AADE challenges RDs/CDEs with the role of patient education. This isn’t a simple feat considering the fact that even the term “prediabetes” is relatively new, and there’s some controversy surrounding diagnosis. For example, there are many physicians who still don’t use the terminology and may simply tell the patient that his or her blood glucose level is a little high. Kathleen Stanley, CDE, RD, LD, MSEd, BC-ADM, diabetes education program coordinator at Central Baptist Hospital in Lexington, Ky., agrees and adds that patient denial is another barrier to overcome—possibly onset at the time of diagnosis. This is where the role of the CDE can be life changing, since adhering to a more healthful lifestyle can delay the onset of type 2 diabetes. Warshaw says RDs/CDEs can recommend their patients start with a few simple goals of eating healthfully and exercising more but that taking on too much at once may overwhelm them and make them more likely to give up. The AADE maintains that part of a successful lifestyle change hinges on recognizing that each patient needs his or her own personalized plan, which may incorporate risk reduction and other prevention-related elements of the AADE7 Self-Care Behaviors. These seven behaviors include healthful eating, being active, monitoring, taking medication, problem solving, reducing risks, and healthful coping. In terms of healthful eating, CDEs can teach self-management education that would include information about how patients can determine their total daily food intake requirements, monitor their food intake, assess the percentage of daily calories from fat, and set an appropriate calorie goal. In addition to dietary changes, CDEs also should encourage an exercise regimen with the target goal of 150 minutes per week—that recommendation coming from the DPP, which is the model most CDEs follow. Though diet and exercise are discussed the most when it comes to prediabetes, other healthful behaviors also are important. “In addition to weight loss, monitoring food intake, and increased physical activity, other general healthful lifestyle changes such as smoking cessation and stress management are lumped in as part of the recommendations that stem from the DDP,” Stanley says. And while education and coaching approaches should target the uniqueness of each individual, according to the AADE, diabetes self-management and prevention programs still can be effective when provided in a group setting, thereby improving cost-effectiveness and reach. Involving peers is another opportunity to create accountability and help ensure patients stick with a regimen. For instance, the YMCA recently launched the YMCA’s Diabetes Prevention Program (YDPP) as part of the Centers for Disease Control and Prevention (CDC)-led National Diabetes Prevention Program. The program features 16 one-hour classroom sessions with a trained lifestyle coach. Following the classroom sessions, participants meet monthly for added support and to monitor progress. Goals include body weight reduction by 7% and participation in 150 minutes of physical activity per week. Though there’s a long road ahead when it comes to research and education, the role that RDs/CDEs are already playing certainly has been crucial in advancing the understanding of prediabetes. Brown-Riggs says she views prediabetes as a window of opportunity in which diabetes educators can help their patients prevent or delay the onset of diabetes. While RDs/CDEs never want to step on the toes of a physician, there are some simple ways to intervene without harming the relationship. There’s seemingly no better time than now for RDs/CDEs to take the initiative to start closing the gap on the massive number of prediabetes cases that go undiagnosed. This means reaching those patients that haven’t been to their healthcare provider or received any testing. The NDEP, a partnership of the National Institutes of Health, the Centers for Disease Control and Prevention, and more than 200 public and private organizations, offers a variety of publications on its website (www.ndep.nih.gov). For instance, the brochure It’s Not Too Late to Prevent Diabetes is a tip sheet to help older adults at risk for type 2 diabetes to move more and eat less. Single copies, up to 25, are free. Each additional package of 25 is $5, and there’s a limit of 150 copies. A variety of other printable articles are available on the website as well as specifically targeted brochures for special categories such as teens and children as well as individual minority groups. Diabetes Pro is the professional section of the ADA website (http://professional.diabetes.org). On it, diabetes educators can access relevant webcasts, journal articles, and other professional resources, including a prediabetes brochure called What Is it and What Can I Do? Materials on the ADA Alert Day, a one-day “wake-up call” event asking the American public to take the Diabetes Risk Test, also can be found on the site. The AADE7 Diabetes Educational Curriculum, derived from systematic literature reviews, is a useful resource found on the AADE website (www.diabeteseducator.org). The AADE7 tools for professionals include goal sheets, a poster, and the AADE7 System (an Internet-based suite of tools for diabetes educators). Also new is a preview of Milner-Fenwick’s patient education DVD called Pre-Diabetes: It’s Time to Make Changes, 2nd edition).